Did you know that long term stress triggers changes in your cat's physical and mental health? How can you de-stress your cat's life? Cat are nothing like humans really, but behaviourally there are more similarities between us and our cats than you may think! Look for the gold standard in veterinary care, a dedicated cat only mobile vet clinic that has ISFM (International Society of Feline Medicine) membership. If looking for a traditional/static practice, look for your local Cat Friendly Clinic. If you must travel to a vet, think about ways you can minimise the impact of stress for your cat. Also have a look at my favourite cat carrier for travelling a cat to the vets. ​Pheromones are potent chemical signals which are widely used for animal communication. When emitted by one individual, pheromones are then detected by other individuals from the same species, and affect their behaviour. 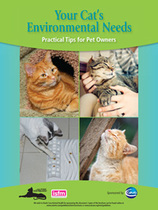 Feliway is not a one stop solution for stress, but it can definitely help when used in conjunction with STEP 1 & 2! ​Try the Feliway App "Make a Cat Friendly Home"
Just like us, cats can be sensitive to sounds. As predators of small mammals, they have evolved to hear pitches that span over ten octaves (to put that into context, Mariah Carey's voice range spans half that octaves and we can hear around!). You'll see from the study linked below that cats can hear much lower frequencies than dogs can & have a wider hearing range - the "lesser" canine species always gets the headlines for having amazing hearing, but just as with most things feline, the cat's hearing is far superior, almost double the range of dogs and both higher & lower! ;-) Unlike us, cats can independently move their ears (like little furry satellite dishes) and hone in on sounds from different directions. Why am I giving you a lecture about cat ears... well it's because these quirky scientific facts help to understand why all the sounds that we take for granted such as fireworks, vacuum cleaners, young children & even the high pitched noises emitted from electrical charging cables and hearing aids, must be very hyperstimulating & even overwhelming for some cats. Our furry feline friends can't control exposure to these noises unless we do! As a classically trained musician myself (albeit very out of practice!) I have found music has a very powerful & emotive influence over my thoughts & mood & over the years I have definitely noticed that my cats seem calmer with soothing classical or meditative forms of music. Could we take this concept seriously & apply it to our cats? Composed music for Felix rather than by Felix (sorry a Mendelssohn joke for the musicians out there)? ​Initial studies into species appropriate music by the University of Wisconsin, suggest that cats are at the very least interested in it. Further studies are needed to evaluate exactly whether this equates to enjoyment or curiosity but initial impressions from testimonials seem to be positive. Of course this in itself is down to how we as humans interpret the cats' behaviour. Another study involved cats under anaesthesia (so completely unconscious!). Each cat was given headphones to listen to a series of pieces of music. I kid you not, they played 2 minutes each of ACDC, Natalie Imbruglia & Barber's Adagio For Strings & compared it with silence. Increases in breathing rate & pupil size were used to measure stress. Cats were more stressed by heavy metal music, than pop music. ​Classical music was the least stressful with low breathing rate and smaller pupil size. There seems to be a role for mellow classical music in vet surgeries to minimise stress, reduces anaesthetic drug doses & risks. Next they plan to measure stress hormones & scan for brain activity.